It takes a little time to restore so please be patient. Keep it in mind that Whatsapp only stores the messages back up for the last 7 days. 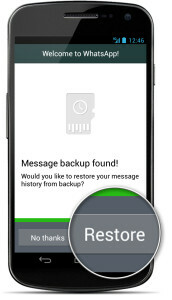 So if you do a restore, only the messages in this time window will be restored. Also, no media files like images, videos and audio clips will not be restored. You have to use a file recovery software for that. Since Whatsapp takes back up at 4 AM, the back up will contain messages before the time of back up. So if you try to restore a message at 7 AM in the morning that was deleted at 6 AM, it is simply not possible. Is it possible to recover messages if the phone was lost and you bought a new phone and simcard. you then do a simswap.